The following recipe has become a midweek staple meal here at Casa B. If you are not a fan of fish this recipe also works very well with chicken but would require more cooking with the chicken pieces being added to the pan at the very start. A low fat, high protein meal perfect for those trying to stay fit and eat well. Gently fry the onion along with 1 tsp of ground cumin for 4-5 minutes until soft. Tip in the tomatoes, harissa paste, courgettes, chickpeas and 250ml cold water and mix well. Leave to simmer for 15-20 minutes until sauce has thickened. While simmering coat the cod fillets in the remaining cumin and a good dose of ground black pepper. In a small pan gently fry each side in Fry Light oil spray for 2 minutes. 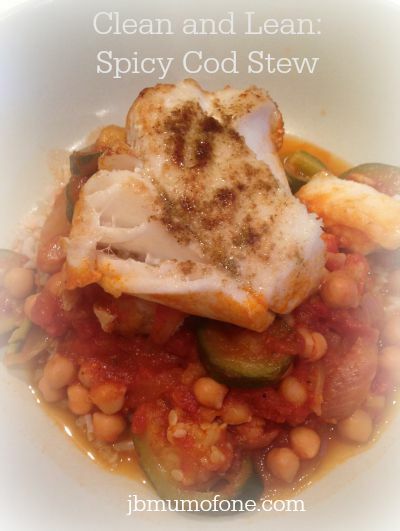 For the remaining 5 minutes of cooking place the cod fillets gently on the top of the chickpea stew to poach, trying not to break up the fish. For more healthy recipe ideas why not follow me on pinterest?